1- Is it really important to keep the levels under 0dB in the track meters (I don't hear any clipping even if they exceed it)? 2- Is gain staging really important (keeping the levels from clipping at the plugins ins/outs in the plugin chain(same here, I don't hear any clipping))? 3- Is it better to keep all the track levels lower and then pushing up the overall level with a limiter, or keep the levels higher and go easier on the limiting? I seem to notice a bit of difference in mixes done in both ways in step 3. The mixes done with the track levels hotter seem to be a bit harsher, less smooth, than the ones done with lower levels and boosted with a limiter. The thing is I don't know if it's a placebo effect, or if the limiter's own sound has something to do with it. Location: On an island in the Pacific.......in Canada. Yes it's important to keep your levels under 0dbfs otherwise you'll get digital clipping. If your meters ever hit the red clip indicator that's bad. Definitely keep recording at 24bit and don't forget to dither when you bounce down to 16bit. I try to keep my master peaking around -6db in my mix. Bring up the level in the master so it limits at -0.2dbfs. Also gain staging is very important, don't be hammering your plugs with high levels. 24bit has a low noise floor so you don't need to max your levels. on channel says otherwise (gets red). You just have to make sure there is no red in the armed tracks when recording (signal is not clipping in the AD stage of your audio interface). When mixing, it won't matter because the precission of the audio engine is much higher than 24bits. It won't even matter on most pluggins. I seem to be getting different opinions here. I know that it's important not to clip the levels at the input when recording and on the master track, but it's at the gain staging (between plugins) and on the individual tracks that I'm not too sure. So does that mean that I don't need to worry about peak levels in gain staging and individual tracks? To me gain staging is watching everything in the entire chain. I try to keep everything around -12, the meters on the input on my adc and then the meter on the track meter in reaper. Also the whole mix in the main outputs. Peaks will jump past that but on average leaving more headroom stops any nasty digital clipping. You can always turn the main output up in the mastering stage. When I do vocals I do it differently leaving about 24db's of headroom. Seems to work nicely. Gain staging in digital daws (once you are past the ADC and before you get to a DAC) is pretty much irrelevant and nothing like analog gain staging. Those good habits from analog don't do any harm though. Neither does going well over 0dBFS in between hardware. Someone should just print a list of all 3rd party plugs that will clip internally at 0dBFS and make it a sticky. The common understanding is to go a little bit lower than that due to intersample peaks that don't meter as clips. -3 or so is more the norm for maximum peak level on the master bus. Not that anyone could actually detect a few clipped samples out of thousands. But it's good practice. Last edited by Lawrence; 09-17-2009 at 05:01 PM. Damn, that seems pretty low. But how do you get your vocals to stand out if they're 12 dB lower than anything else? -3 or so is more the norm for maximum peak level on the master bus. Did you mean -.03? -3 seems a bit too much headroom no? The Audio Engineering Society recommends that -18dBFS be equivalent to +4dBu, or 0 dBVU. If you track with that in mind, meaning keeping the average level of the track at -18 on reaper's track meters (as long as you don't clip on peaks), you'll be capturing 23 bit files...with a possible 138 dB dynamic range, from noisefloor to peak. The same thing applies when mixing, except you'll need to insert a trim/gain reduction plug-in on most if not all tracks to tweak things back into a range that will allow additive or subtractive processing...and still allow that 6dB of headroom on the mix buss for when you master to -0.01dBFS, and take full advantage of 24 bit digital. Proper application of this, as well as good capture/engineering technique when tracking will make your mixes sound bloody HUGE and Clean and Punchy and PHAT, and all those good things people miss from the good old analog days. You'll find yourself using less EQ, fooling with compression a lot less. -0.03 is fine for a master peak level... but I would be perfectly happy sending off a premaster at -3dbFS. Typically mix engineers leave at least that much headroom for the ME. Unless you're trying to get every last bit of volume for the loudness war it's pretty much irrelevant, and even then since peak level has little to do with RMS level and/or how loud the thing sounds. You can "L2" a thing that peaks at -6 that sounds loud as heck. Peaking at -0.03 would be susceptible to intersample peaks that may occasionally clip the converters during reconstruction. It's more a "working practice" than anything you'd notice or hear. But there is no practical reason to even approach 0 that closely... it won't sound any better. These discussions always waver around between hobbist/semi-pro/pro so some of the stuff gets smeared a little bit. Most professional engineers are leaving a few db of headroom for those two reasons I mentioned above, ME headroom and intersample clipping. For most hobbyists and many people mixing at home with no intention of pro mastering, even an occasional clip at 0 on the master is pretty much irrelevant as evidenced by the fact that you don't really hear the occasional clips, you just happen to see the red light come on. For stuff not going to mastering I put on an L2 at -1 and don't worry about it. 2. You Don't Need To Normalize Or Get It As Loud As Possible - Keep in mind most Mastering Engineers like some head room. Even having your mix peaking 2db below zero is great. I regularly turn in mixes with peaks at -12db since that's where I find my gain staging sounds good on the console I work on. The mastering engineer will have great gear to gain stage it as long as you go to a pro. Although its good practice to get a strong signal, dont let the audio clip at all! If your hitting 0db at mixdown, your pushing the levels too much. Getting your tracks to peak at a maximum of around -3dB gives the mastering engineer headroom to work with. That kind of advice is pretty common from ME's. It's minutia that was settled (in the pro realm) many years ago but it regularly comes up in Internet discussions from people anyway. In most of those cases it's far from important, a few samples clipping. Last edited by Lawrence; 09-18-2009 at 12:12 PM. The most significant bit (say 24 in that context, even though it should be called 23, starting numbering from 0, as usual in IT...) is set to "on" when the level exceeds -6dB. The levels in the area around -0.03 dB are actually encoded in the least significant bits with all higher bits already set to 1. Even if you'd only use 16 bit from the 24 bit converter you would still benefit from the 24 bit format in the sense of lower distortion, but as you said with lower dynamic range. Like Lawrence said, clipping at the track output level isn't meaningful in a 64 bit DAW. If you want to pay attention to track levels and keep them below the red that's fine, but nothing gets ruined or degraded if you run tracks at +100 dB or whatever. Yeah, I find working without the distraction of clip lights on audio channels a tiny bit of freedom. Ooops... I meant -.3, not -.03. But anyway, from the answers you guys give me, I don't think that would change anything. The thing I was most worried about was the gain staging. So I think I'll keep the master reasonably under 0, and squeeze some dBs out of the mix with a limiter. By the way, I don't know if you guys tried PSP's Xenon. It's a lot more transparent than the L2 and A LOT cheaper. Or even Voxengo's Elephant, but I'm digressing here. Thanx a lot for the input guys. I think I had quicker answers here in a couple days than searching around the web for weeks. Actually the Reaper community was one of the reasons I chose to switch to Reaper. I don't foresee looking back anytime soon. You're correct on both points; "bit 23, the 24th bit" and it being "on" when the level exceeds -6dBFS. Quite counter-intuitive for non-techies, isn't it? quantization process decides to round the last bit's value from 0 to 1. -6.02 dBFS peak is exactly 23 bits (counting from 1) and the last bit is 0, no? is there a quick way to find out? I have a feeling a lot of DSP card based plugs run in fixed point,which would mean they'd clip. Well, digi-clipping is so ugly, so obvious. Use your ears..
Last edited by politcat; 09-23-2009 at 04:03 AM. Not necessarily. PTHD for instance runs at 48-bit fixed point / double precision and while it's internal clipping point is nowhere near where it would be in floating point (as it relates to levels on the daw meter) it's still far above the levels where anyone would reasonably push a signal. Not sure exactly but +40 or thereabouts over 0 on the meter I think. Someone else can give a precise level but it's not 0 on a 24-bit metered scale. The only thing that clips at 0 in a daw is something doing raw 24-bit processing internally which afaik, is no daw or hardware DSP these days. If TDM plugs hold true to that internal depth they shouldn't clip at digital 0 internally either. Of course I don't have PTHD so I cannot test that for myself. If they process at 24-bit fixed then yeah, they'd clip at 0. But don't confuse the 24-bit fixed scale of the meters with even a more dynamic internal fixed scale that goes beyond what the 24-bit meter is showing. The meter is set to 24-bit fixed to represent the limits of converters, all daws internally go far beyond that... even fixed point daws and I suspect all DSP hardware like UAD (floating point) or Duende (?). Yeah. Put Waves Linear at the top of it. You can see below why internal clipping (on a 24-bit meter's 0 point) shouldn't occur even in fixed point beyond 24-bit. Here it doubles the dynamic range to 288db for dsp processing. So even in PTHD fixed point there is almost 48db of headroom above 0 before clipping occurs. The arrow marks 0 on the 24-bit scale, or the daw meters. I hope that clears up some common misconceptions. Last edited by Lawrence; 09-23-2009 at 10:14 AM. 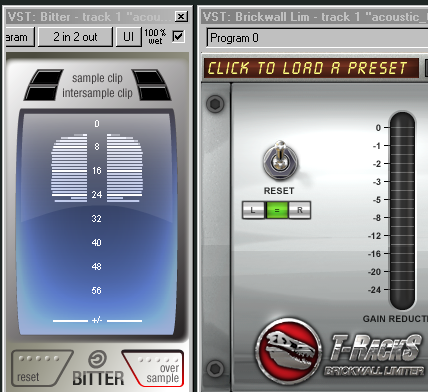 all the other T-Racks3 plugins are 32 bit. ??? Every time the floating point number exceeds 1.0 or goes below 0.1 the exponent shifts, giving you a change of precision on one end of the 53(52+1 actually) bit mantissa. This is a 20 dB shift in fact, and thus a little over three bits of precision. So if you cross the 1.0 line (0dB FS in the tracks) a little over three bits of precision die a truncation death at the bottom of the 53 bit number that is your audio. Muahahaha! So no matter what happens, the precision will always be greater than the mixbus of Protools. I think. Probably. Are you scared yet? Think it's gonna blow your chances at a hit record ? You're right !!!!! Your cat'll probably kill you in your sleep for playing with your levels in this fashion. Amateur fears are so easy to exploit. That's how PR works for DAWs . Right, and people have to get used to the fact that overly hot tracks make things sound like a$$. Just make music. record it, mix it, get it out there. if it has legs, it will run. keep it simple, let it breathe.